Do you have unsightly stumps taking up space on your property? At Family Tree Services, we offer cost-effective stump grinding service in Asheville, NC. With a professional-grade stump grinding machine, we can quickly remove any number of bothersome tree stumps from your property to clear space, remove tripping hazards, and keep termites from setting up their home in your backyard. There are two primary ways to get rid of a tree stump: grinding or removal. Stump removal is a good choice for smaller trees that do not have thick, extensive root systems. This process involves cutting off the root system of the stump and digging up most of the stump so it can be lifted with a crane. If you have an old or large tree, removal may not be possible as it’s just too difficult to remove the root system. Removal can be challenging because the root ball beneath the stump can be up to 10 times as large as the tree. This service does leave a hole in the ground, but it’s the best way to be sure the tree will not grow back as the roots will be fully removed. Grinding a stump is the most efficient way to clear your land. This service avoids the need to dig up your property completely. Once the tree is cut down close to the ground, a stump grinding machine is used to quickly shred the stump into wood chips and mulch. The stump will be below ground level and can be covered with fertilizer or soil. In most cases, the stump will be ground down 16″ or so below the surface. This will leave plenty of soil depth to grow grass, plants, or a new tree. A shallow grind to just 4″ below grade can reduce your cost and still allow for grass growth. Our professional-grade stump grinding machine has a low profile and wheels which makes it easy to grind stumps even in hard-to-reach or small areas of your property. In most cases, we can also grind stumps on hills and next to walls, foundations, and sidewalks. Depending on the existing infrastructure, we take great care to avoid damage to your property. We also offer a discount if you need multiple stumps removed or you need to clear a large area of land. While you can rent a grinding machine yourself in Buncombe County, we urge extreme caution if you attempt to grind a stump yourself. These machines can be very dangerous and require protective gear. You are also unlikely to save much money as the rental cost and additional costs for fuel and teeth can add up. Contact us today for a free estimate on stump grinder services. Do you have bothersome tree stumps on your property? Old stumps aren’t just an eyesore; they can also be a hazard. There are many reasons to consider stump removal for your home or business. Stumps can easily pose a safety hazard, especially when children are playing in the yard and not watching for trip hazards. Leaving stumps on your property can even expose you to liability if a neighbor or guest trips and gets hurt. It isn’t just injuries you should worry about; stumps that are low to the ground can damage your lawn mower. You spend a lot of time and effort keeping your lawn looking its best. Unsightly stumps can detract from an otherwise well-kempt lawn and beautiful landscaping on your property. Sometimes a stump left behind can cause new tree shoots to pop up. Unless you spend time and effort to control new growth, it can lead to tiny trees growing up to several feet away from the stump. New growth can be a pain to deal with, detract from the appearance of your lawn, and leech nutrients from nearby plants. A large stump can take up to a decade or two to rot away if it isn’t treated. As it decays, it will attract a variety of pests like ants, beetles, and termites. While many of these pests pose no threat while outdoors, a stump near your home can invite wood-boring pests like termites into your home. Once inside, they can cause extensive structural damage to your home. At Family Tree Services, we take pride in serving Buncombe County with cost-effective and reliable stump grinding and removal services. 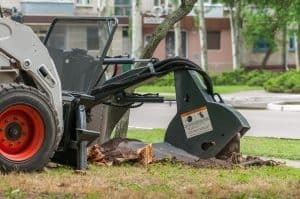 Whether you have one, three, or a dozen problematic stumps on your property, we can remove them completely to leave your yard safe and beautiful. You can trust our technicians to respect your property and carefully maneuver the equipment without causing damage. Ready to say goodbye to ugly, pest-infested stumps on your property? Contact Family Tree Services today for an estimate.